Most powerful spider model in the legendary marque's history, the 2015 Ferrari 458 Speciale A makes its global debut in Paris. Drawing its distinctive designation from the Italian "Aperta" for open, this limited-edition drop top shares much of the technology introduced on the 2014 Ferrari 458 Speciale Coupe that bowed a year ago, including a mid-mounted 4.5-liter naturally aspirated V8 upgraded from 562 to 597 horsepower and a 7-speed, dual-clutch semi-automatic. Only 499 of these new al fresco A-listers will be produced for the world, and at this point, there's still no info on exactly how many may turn up here. Although prices haven't been announced, we suggest you start thinking somewhere around the $325K mark. Like the conventional 458 Spider, the new Speciale A features the same modified rear deck and twin-buttress treatment to accommodate a retractable aluminum roof. Like the base 458 Spider, it cycles in just 14 seconds. There's also a series of structural enhancements to the car. The Special A employs a number of wind-cheating tweaks found on the 458 Speciale Coupe including "active" front/rear elements that make it the most aerodynamically efficient spider model ever from Ferrari. Although the 458 Speciale A weighs 110 pounds more than its Coupe counterpart, that extra mass doesn't seem to have impacted the performance potential of this hard-core convertible. Ferrari says it has an identical 3.0-second 0-62 mph sprint time and the firm's trick Side Slip Angle Control system also helps it match the Speciale Coupe's 1-minute 23.5-second clocking around the factory's Fiorano test track. 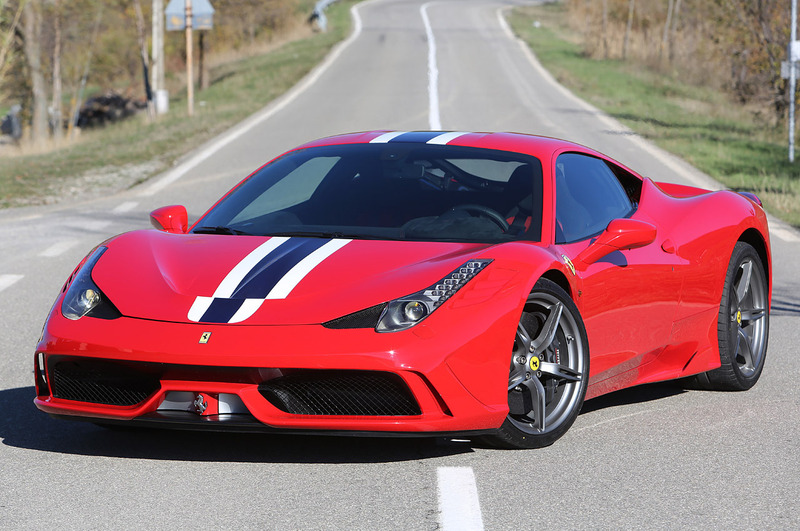 While Ferrari cited no maximum velocity figure for the 458 Speciale A, it's certain to at least approach the 202-mph top-end potential of its hard-shell sibling. For its Paris coming out party, the 2015 Ferrari 458 Speciale A is finished in a unique triple-layer yellow livery set off with a Blu Nart and Bianco Avus central stripe as well as forged, 5-spoke Grigio Corsa wheels. While color-keyed to its exterior, the car's competition-inspired cabin design parallels that of the Speciale Coupe. New sport buckets are wrapped in in black Alcantara with yellow contrast stitching and 3D technical fabric inserts. Completing the look are new blue carbon fiber accents on the dash, door panels, central tunnel and door-sill plates.